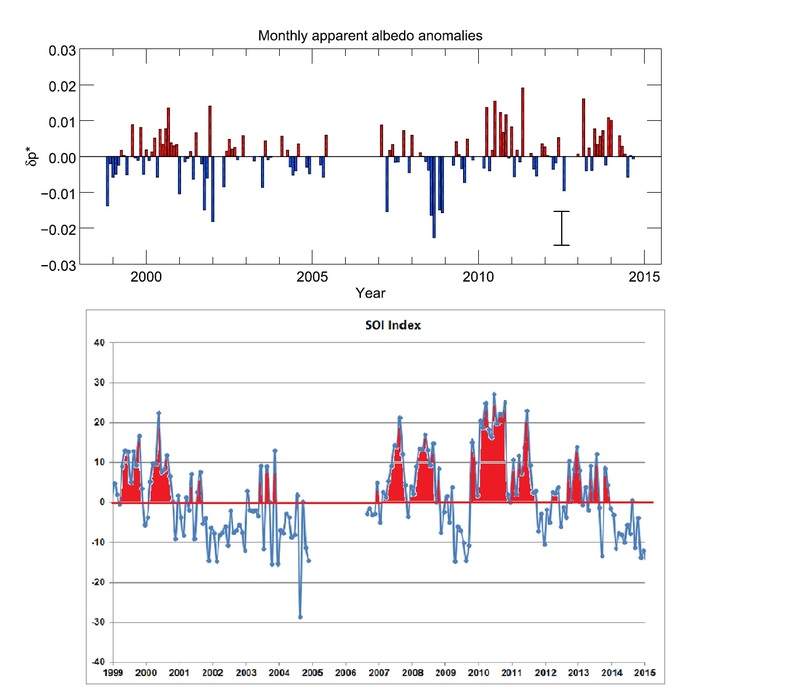 Figures 1a shows the mean monthly apparent albedo anomalies from December 1998 to December 2014 as measured by ground-based earth-shine observations. The anomalies are calculated over the mean of the full period and positive anomalies are shown in red and negative in blue. The averaged standard deviation (error) of the monthly data is also indicated in the lower right corner. The SOI has be shifted backward in time by 6 months. Not withstanding the large error bars associated with the mean monthly apparent albedo anomalies, and the gap in the albedo anomaly data between June 2005 and December 2006, there appears to be rough correlation between the retarded SOI and the monthly apparent albedo anomaly. If this correlation has any validity then I would predict that the Earth's mean monthly albedo anomaly will remain in negative territory from late 2014 till the end of 2015. The next few of years of data from the Earth-shine project should be very interesting if it does. Moderate to strong El Nino events are triggered by the inter-annual variability in the lunar tides. Moderate to strong El Nino events are triggered by long-term (i.e. inter-annual) variability in the lunar tides. Specifically, the timing of these events is directly related to 31/62 year Perigee/Syzygy lunar tidal cycle. I do not have all the answers as to how this actually happens but the best answer that I can come up with is that slow forcings applied to the Earth by the lunar tides influences the formation and subsequent propagation of Madden-Julian Oscillations (MJO) along the Equatorial Indian Ocean and Pacific Oceans. A MJO consists of a large-scale coupling between the atmospheric circulation and atmospheric deep convection. When a MJO is at its strongest, between the western Indian and western Pacific Oceans, it exhibits characteristics that approximate those of a hybrid-cross between a convectively-coupled Kelvin wave and an Equatorial Rossby wave. When a MJO moves from the western Indian Ocean into the western Pacific Ocean, it generally accelerates, becomes less strongly coupled to convection, and transitions into a convectively de-coupled (i.e. dry) Kelvin wave. Periodically (i.e. roughly once every 4.5 years), the precise alignments of the lunar tidal forcings produce the right conditions that result an upsurge in the number and magnitude of what I call Pacific Penetrating MJO. These are MJO events that travel from the Eastern equatorial Indian Ocean, along the Equator, all the way into the Western Pacific Ocean, where they initiate Westerly Wind Bursts (WWB’s). The spawning of these WWB’s takes place as the MJO event is transitioning from a hybrid-cross between, a convectively-coupled Kelvin wave and an Equatorial Rossby wave, and a convectively de-coupled (i.e. dry) Kelvin wave. The spawning of the WWB’s occurs in the Western Equatorial Pacific Ocean, somewhere between 60 deg E and 150 deg W longitude. The actual process involves the formation of a typhoon/cyclone pair straddling the equator which produces an intense WWB between the two intense low pressure cells. The onset of El Nino event are marked by the weakening of the easterly trade winds associated with the Walker circulation. The actual drop off in easterly trade wind strength is always preceded by a marked increase in WWB’s in the western equatorial Pacific Ocean. The WWB’s help initiate an El Nino event by creating downwelling Kelvin waves in the western Pacific that propagate towards the eastern Pacific, where they produce intense localized warming, as well as by generating easterly moving equatorial surface currents which transport warm water from the warm pool region into the central Pacific. El Niño events in New Moon epochs preferentially occur near times when the lunar line-of-apse aligns with the Sun at the times of the Solstices. El Niño events in the Full Moon epochs preferentially occur near times when the lunar line-of-apse aligns with the Sun at the times of the Equinoxes. Are we looking in the wrong place for the connection between solar insolation and the world's mean temperature? I propose that it is the lunar tidal modulation of the seasonal variations in the solar flux, coupled with the hemispherical asymmetry of the Earth’s surface properties (i.e. Nth Hemisphere – dominated by continents, St Hemisphere – dominated by oceans) that is responsible for setting the world's mean temperature. The climate variation is driven by the ratio in strength and frequency of El Nino to La Nina events – This is dominated by the 31/62 year lunar tidal cycle. For 31 years, El Ninos start in years when lunar line-of-apse is pointed at the Sun near the Winter/Summer solstices, then for next 31 years, El Ninos start in years when lunar line-of-apse is pointed at the Sun near the Vernal/Autumnal equinoxes. The climate variation appear to be correlated with variations in the overall strength of the Sun’s magnetic field as indicated by Be10 and C14 proxies. These primarily occur at 88.5 years (Gleissberg cycle), 208 years (de Vries Cycle), 354 years, 510 years, 708 years, 980 years (Eddy Cycle) and 2300 years (Hallstatt Cycle). It just so happens that these cycles in the Sun’s magnetic field strength are matched by the times at which the lunar line-of-apse points at the Sun at either the solstices or equinoxes of the Earth’s seasonal calendar (in a reference frame that is fixed with respect to the Earth’s orbit). This produces a long term 21,000 year climate forcing which when coupled with the Milankovitch orbital forcing and the formation and melting of ice sheets at the Earth’s poles, produces the ice-age cycles. 132.887 days in 75970.375 days = 0.0017492 of a full cycle in 208 tropical years. or 10.90 ~ 11 arc second per tropical year! 11.62 arc seconds per year – observed epoch 2000.
perihelion precession of the Earth’s orbit).